Are you shopping for a cafe umbrella to use at your outdoor dining patio? 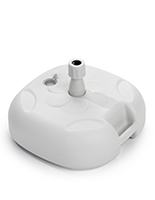 This site features various sizes and print options suitable for commercial use. Cafe umbrellas, also known as patio umbrellas, are great for outdoor restaurants, festivals, poolside dining, and hotels. The custom units offer a cool place to sit under and an alternate advertising space. These custom cafe umbrellas are sold with your company's name, logo, or sponsor printed onto the canopy or valance. Dynamic images and messages can be easily read from a distance. Outdoor restaurants, hotels, and ice cream shops can use these sun shades to promote the food and beverage brands that they offer. Customers can tell exactly what is served without seeing a menu. Beaches can use cafe umbrellas to attract business and provide shade to patrons. These promotional tools are fashionable and functional. 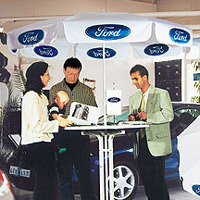 Printed cafe umbrellas are effective promotional fixtures for both indoors and out. Indoor applications include trade shows, conventions, beer tastings, and concert refreshment stands. 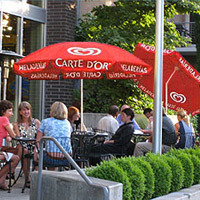 Advertising umbrellas, patio umbrellas, and other cafe umbrellas are designed as commercial media, and are not intended to protect users from inclement weather. Please refrain from using in high winds. Printed patio umbrellas are designed to provide minimal shelter from the sun. Use them outside in the summer and bring inside during inclement weather conditions. With steel alloy frames with a white epoxy powder-coated finish, cafe umbrellas will not rust or rot over time. Each restaurant umbrella has a built-in tilt mechanism to shade the sun, and stake at the end to be driven into soft grounds. Some come with water filled bases for extra stability. We sell water-filled bases for these patio umbrellas for use on hard surfaces. Custom cafe umbrellas feature rugged fabric canopies that are custom printed with your graphics. These advertising displays will say exactly what is necessary. We sell screen and digitally printed cafe umbrellas. Cafe umbrellas are imprinted onto a 100% knitted polyester fabric that is fast drying and resists fading in the sun. Users can leave these items out and not worry about damage. While these umbrellas are not initially waterproof, a simple spray can be purchased to make them capable of withstanding moderate rainfall. What if I need just one cafe umbrella? Shoppers looking to buy a single unit should select the digital print fixtures. 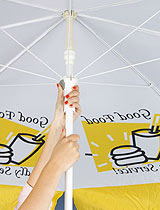 The cafe umbrella with other print options are only sold in multiples of ten, and are intended for more simplistic designs. All of these patio sun-shades feature a custom imprint that will promote your institution while providing your patrons with a cozy place to relax. Can these umbrellas be washed? This fabric sun shade can be kept clean with a mild detergent and water. As with any custom printed material, this cafe umbrella should be tested in a small spot prior to washing the entire surface. For further details regarding any of the patio fixtures sold here, contact a member of our call center staff. We sell cafe umbrellas in a variety of styles for you to choose from. Get the model that best exemplifies the business. In addition to advertising umbrellas, we also sell a huge selection promotional products and event displays that may better suit your needs. 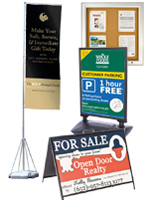 Displays2go provides everything from custom gazebos and event flags, to flying banners and outdoor displays. Browse this main shopping categories to see thousands of retail, trade show, and point of purchase displays that are in stock and ready to ship. If you need assistance, please contact one of our knowledgeable customer service experts for more information. In addition to the custom promotional fixtures featured here, there is also a huge selection of quality products offered on this site. Choose from more than 7,000 unique items in this online catalog. This online retailer has been doing business for over forty years, and is one of the nation's largest suppliers and manufacturers of quality point of purchase and tradeshow displays. Buy with confidence here at Displays2go!